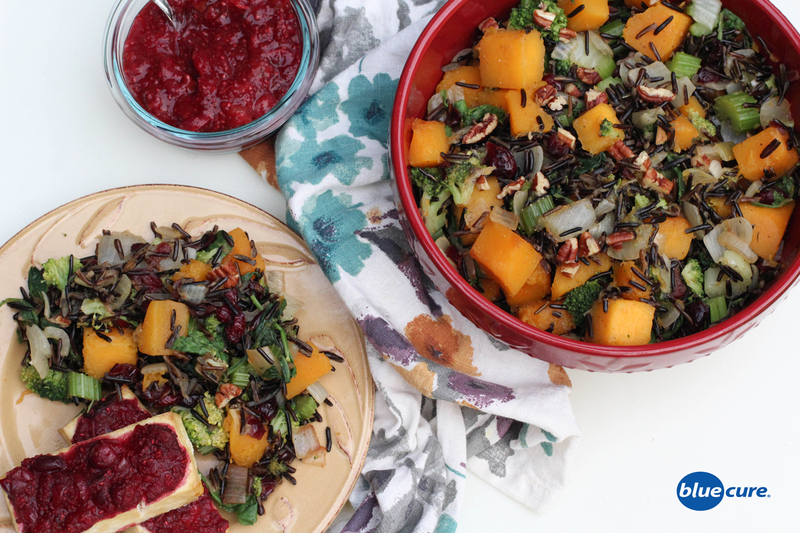 This butternut- squash wild rice salad is light and delicious. It’s packed with nutrients and flavor, and not shy on the veggies. Perfect for fall and winter holidays— or even just weekday meals. For those that celebrate Thanksgiving, this dish is a perfect complement to any Thanksgiving meal. Pictured here is butternut squash- wild rice salad with cranberry-baked tofu. If you plan to make this dish a main course, add in some beans for additional plant-protein. Rinse the wild rice. Combine the rice, water, and rosemary in a sauce pan and bring to a boil. Once boiling, reduce the heat and cover the rice to cook. Allow the rise to simmer for ~40 minutes. Continue to cook until the rice kernels start to crack open. Preheat the oven to 400F. Wash and chop the veggies. Line a baking sheet with parchment paper. Add the cubed butternut squash to the tray and bake for 30-40 minutes or until desired texture. Sauté the onion and celery with a splash of water until tender. Add in the broccoli and continue to sauté. Add more water as needed to keep the veggies from sticking. Finally, add in the greens, cranberries, garlic, and pepper. Cook until the veggies are desired texture. In a serving bowl, combine the rice, butternut squash, and veggies. Top with chopped walnuts or pecans and enjoy!